Today, I've got the singlefor those of you who have been following along weekly. However, if you're just jumping in, I've got the entire sheet ready for reasons #28-36. Whoo hoo! Here are the links for the blank cards. This is the link for reasons #1-#18. For reasons #19-27 click here. Now, you are totally caught up! I've also got November's Free Calendar ready for you, too. I used my calendar collection, Celebrate Scrap to design it. It's new in the shop and that means it's on SALE. You get a whole lot of scrap-a-liciousness in there for a Cherry price! I think the calendar came out great so far, don't you? Tell me in the comments. It's always a treat hearing from readers. I used my PSE for this. Simply click on "New" document after clicking on File and type in the size you need. I used 8.5x5.5 for this one. Then you need to go to "File", "Open" and locate your calendar. It might be in "Downloads". Slide in your calendar into your new document and place and size it how you like. I used my color picker on the calendar and colored in the background. You can always clip in a paper as well. Easy, right?! If you missed yesterday's blog, head on back there! It's full of scrappy goodness and freebies as usual. I've got some new fantastic templates in both of my shops, today and some pages that will certainly inspire you. There is also a new challenge in the group that you might want to join in on. Read more to find out how to get a free gift for doing all 12 challenges by the end of December. 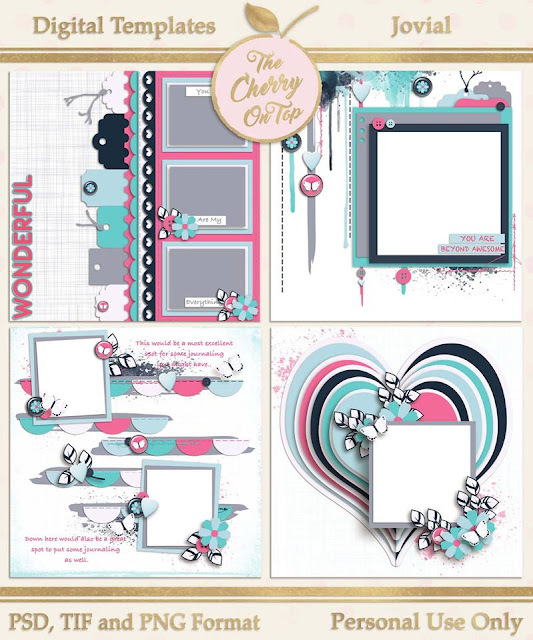 I've got a winner for the Heart my Shop and new cuttable files in the shop. I've also got PAGE format in the Scrappy Sistersshop! I'm selling page for the rest of the year on all new templates to see how things go. Pop over to our scrap-a-licious groupon FB and check out the "Photos"/"Albums" tabs where you can find our monthly challenges. They are full of FREEBIESand inspiration for you to get scrappy. If you put a page into each month's album by the end of December, I'll be sending you a nifty gifty. I've even got a new, free template up for November. Here's a nifty freebie from the Studio. I've put some pretty cut files in the Kreative Design Studio. Pop over and check them out. The winner of the Heart My Shop this time around is Doriangoodyk1! Whoo hoo and thanks for all who visited the shop and left us some love. I'll be back tomorrow with the new, free Why I Love You card for your mini album. So, I'll see you then. We've added a great deal to our past mini freebie and I know you're going to love the new additions. Nearly thirty papers and 80 elements make this one very large collection. There are coordinating templates and some pretty fabulous word art, too. Come take a look at it and the layout love from The Cherries. I told you it was scrap-tastic! You are going to have SO much fun scrapping yourself scrapping, your friends scrapping or maybe some screen shots or projects you've designed. Of course, you don't have to scrap scrap related pics. There is a lot of really cute technical gadgets and traditional goodies for any kind of pictures. The colours are full of sass and fun! The first bunch of pages are all mine. I went a bit crazy with this collection. It was just SO much fun to scrapbook with. First, I just had to use that word art and many of the super papers. Then, I thought I'd give a go at a more artistic look. There are plenty of artsy goodies in there. Stamps of various sorts, doodles, splats and papers. I used one of the templates for this and just added a cool effect on the tablet and used Flerg's Insta-Bling on the scatter. I HAVE to remember that one. Oh! I nearly forgot to tell you! I made a videoshowing how to customize this template very, very easily, in just a few quick steps. Speaking of which, the templates are also sold separately. I love an opportunity to show off several of the papers and these templates certainly allow for that. Here I used just the template and paired it up with a gorgeous new collection from Aimee Harrison Designs, Fruit Of Life. That's mah' boy showing off our HUGE apricots. These colours are beautiful! Here are a few pages from my team. Below, is another awesome template from Made By Keuntje, Bejeweled. I hope you are signed up for the newsletter! I just gave away a really fun, new template for your FB wall. Stay up to date with our weekly newsletter. We've got a lot going on and you certainly wouldn't want to miss any of the free stuff. And that's an image of the free calendar that will be available on tomorrow's Hybrid Saturday blogalong with our free printable 52 Reasons Why I Love You cards. We've got another sheet full for you! You've seen Aimee's new collection. Here is a new kit, A Stitch In Time from Throwing Some Scraps Aroundand a template from Bits N' Pieces. Loving the fun sewing theme and the colours are really pretty. Precious Pocketsare obviously Project Life style and insanely popular. Go check them out. Jodi has a freebie in her group. Rachelle has an awesome freebie for newslettersubscribers this week. Consider signing up so you don't miss the good stuff. Here is a link to get you started on the My Memories blog train. Go to Aimee's blog and see how to ride the train of freebies. If you are into cuttable designs, STAY TUNED! I've got some more getting ready for the shop. I had some seriously savvy cuttable peeps playing with these slightly challenging svg and png designs. Take a peek. I'd like to get a few more crafty ladies to try them on various machines before I get them in the shop. Thanks so much for joining us for Freebie Friday, here at The Cherry.